Limited Numbered Release: Canadian native Steve Thomas was born and raised in southern Ontario. Thomas went to school in Ohio for informational graphics and started working in the art department at a newspaper in Pittsburgh. He met his wife, a fellow Canadian, while in the 'Burgh and moved to the Twin Cities of Minnesota. Steve Thomas worked for another newspaper there creating graphics and illustration before switching over to the online publication. Working as a freelance illustrator, Steve's commercial work has paired him with Disney, Lucasfilm, Marvel, The Muppets, Hasbro and Star Trek. Heavily influenced by the Golden Age of Illustration, Steve Thomas' vintage 1930's style posters capture the beauty and unique nature of California's Central Coast. 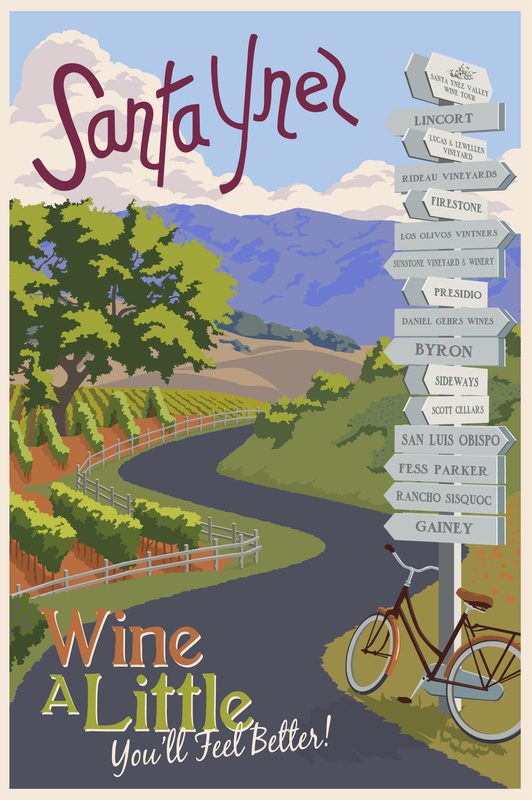 Only 900 released of "Santa Ynez - Wine a Little, You'll Feel Better" signed and numbered giclee on paper,12" x 18".